Google is preparing to expand the availability of Duplex, its automated calling feature for Google Assistant, to iPhones in the coming weeks, allowing users of the digital assistant to book tables at restaurants in 43 states across the United States. 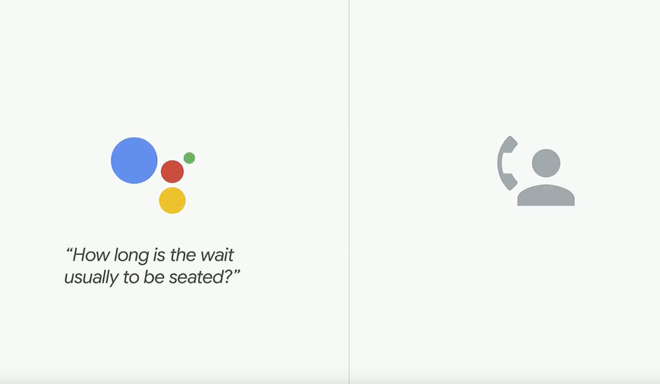 First shown at Google I/O in May 2018, Duplex is a function of Google Assistant that can make calls to businesses on behalf of the user, enabling them to make appointments or to book services without needing to speak to any employees. While it has been available for a while on the Google Pixel smartphones, it will soon be usable on the iPhone. A Wednesday blog post by Google Assistant Engineering VP Scott Huffman advises Duplex can be used to book restaurant reservations over the phone in 43 U.S. states. Currently limited to the Pixel line, the search giant will be enabling Duplex in Google Assistant running on other Android devices, as well as the iOS app. The assistant takes advantage of Google's natural language research to perform a phone call to the selected restaurant, making queries with the employee answering the phone about a potential booking. Triggered by a command such as "Book a table for four people at [restaurant] tomorrow night," the assistant will advise of the party size and when the booking should be made, as well as the name. If a reservation is made successfully, the user is provided with a notification on their device, as well as an email and a calendar invite. Google Duplex serves to fix an issue where a high number of small businesses do not offer an online booking system for their services, but do have the capability of taking appointments over the phone. Different voices are able to be used, complete with filler sounds such as "umm" and "ah" to make the virtual caller seem more human-like, with the cadence of voice able to change on the fly. At the same time as making a booking, the technology also helps Google update its business listings for holiday hours, and could also help update Google Maps with correct information, allowing those using the search engine and mapping app to get more accurate results.